When the Advanced Class Guide came out, one of the major hybrids a large number of people were surprised to find missing was a Rogue/Caster combination. Fortunately, Marc Radle and Kobold Press have filled that hole, and they've done so with flair and skill. 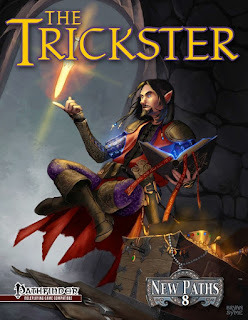 The Trickster, clearly inspired by and borrowing elements from the Arcane Trickster PrC, is a 20 level base class that elevates and enhances the ideas embodied by the Arcane Trickster and makes the concept playable right from first level. The Trickster features a 3/4 BAB, 6+Int skills, good Reflex and Will saves, 6 level Int-based arcane spellcasting that works similarly to the casting system seen in the Arcanist class, and sneak attack scaling up to 7d6. In addition to these solid mechanics that form the functional skeleton of the class, the Trickster also gains Trapfinding, bonuses to thematic skills, evasion, a pseudo Spellstrike ability called Sneakspell that can be used with melee sneak attacks, three bonus feats, Uncanny Dodge and Improved Uncanny Dodge, Ranged Legerdemain as the Arcane Trickster, Filch Spell which allows him to attempt to redirect an enemy's spell, and the Master Trickster capstone, which allows him to treat all 1's and 2's on his sneak attack dice as 3's and apply a metamagic feat he knows for free when using his Sneakspell ability. Acrobat- The Acrobat Forte enhances the Trickster's mobility, reducing ACP in light armor and even increasing his AC in light or no armor. Arcane Accomplice- Grants the Trickster a familiar who gains a variety of unique abilities that assist it in aiding the Trickster. Beguile- A set of mechanics presumably inspired by and presented in homage to the 3.5 Beguiler, Tricksters who choose this Forte find that their spells are more effective against enemies who would be denied their Dex to AC, as well as bonuses to Bluff and feint. This Forte really makes the Trickster's Sneakspell class feature particularly effective and potent when used intelligently. Spell Pilfer- Another mechanic that the reminds me of a 3.5 class, this time the Spellthief, Spell Pilfer allows the Trickster to steal an enemy's spell, removing it from their list of spells known/prepared and adding it to the Trickster's. Overall, the depth and potential of this class is really impressive to me, and I'm looking forward to spending more time playing with the numerous characters this class enables. I strongly recommend this to anyone who's a fan of the Arcane Trickster class, anyone who found themselves missing a skilled/caster combo from the ACG, and really anyone who likes the idea of an effective and versatile class that offers a broad array of potential character builds.